Bosbaan can be found just outside of the center of Amsterdam and is easily reachable via car, bike and public transport which makes it very popular. 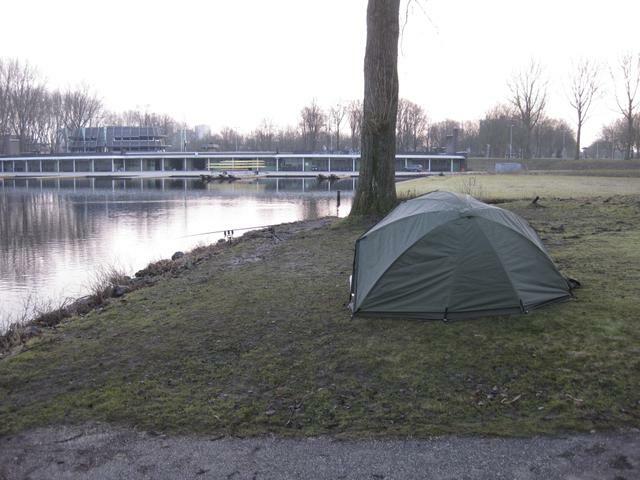 It is stocked with carp, bream, pike and zander as well as perch and silver fish. The primary species I fished for were the carp but I also dabbled with pike and zander. There is also rumored to be at least 1 cat fish in the lake which a mate Tom seemed to hook one evening ( which smashed him up sadly). The carp run to about 35lb and I have never mat someone who has actually caught it 🙂 the zander run to about 15lb+ which I have witnessed when I pulled a very dead decaying 1m+ zander of of the water one session. The lake is about 2km long and is lined with rocks for a distance of about 10ft, the lake then levels out to a sandy bottom at 8ft deep with a deeper area near the channel that bisects it at the mid point. The bottom is generally snag free apart from the main cable that runs in a channel all the way up the lake along the center line. There are also mussel beds which are a hot spot at any time of the year but will require the use of a shock leader. Note that free baiting is against the rules here ( and will apparently get you a fine…) that being said no one ever said you couldn’t use big PVA bags 🙂 . There are also several areas that are no fishing, basically the boat house areas at both ends and the area between the viewing stand and the boat house on the right hand side. One other global note is that backleads are essential, there will be boats going over your lines from 8am – 10pm in the summer and it is essential that you keep the lines low in the water. 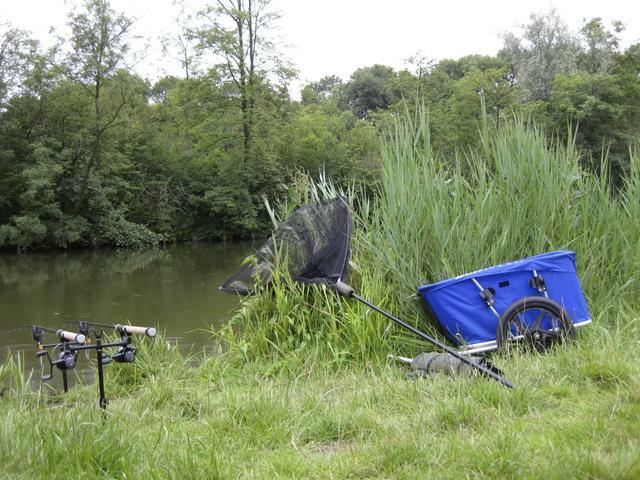 There are also platforms for the disabled scattered around the lake, fishing on them is strictly reserved for the disabled, however nothing stops you from setting up next to one and using it to land and return fish. 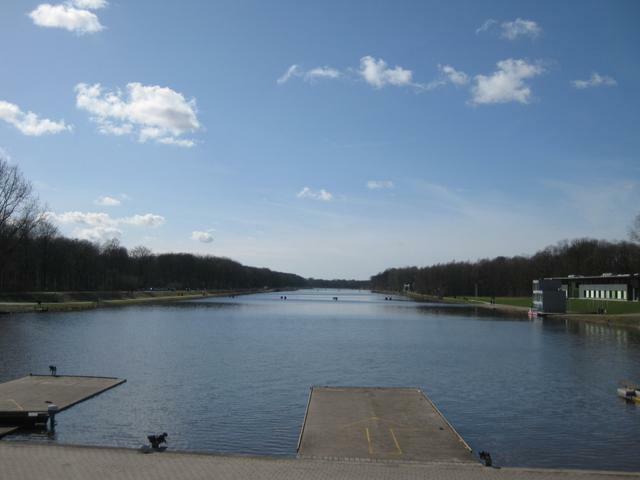 As the primary purpose of the lake is to hold rowing events it is often closedduring the summer months. These closures are when they put in the steel cables that make the rowing lanes. Sometimes these cables can remain in place for weeks, in fact last year the main body of the lake was out of commission fishing wise for 3 months. Check this link to see if the lake will be closed, then again it is often just best to ask in the local tackle shop as the website is not often correct. Starting at the bottom right hand corner of the lake ( see google map below) the 1st swim is under some oak trees and is the most popular swim on the lake. If you want to fish this swim on the weekend in the summer – good luck. The reason it is popular is because the other side and the whole of the right hand side ( the boat houses) are no fishing zones. There is also the commonly held belief that casting into the rowing area will produce fish. Please note that this is dangerous as people are walking around this area all the time, a crack off ( or even a messed up cast) could be deadly and do you want that on your conscience ? Swim 1 is also popular is it is one of the only swims that has an easy access to the water which as the lake can be prolific can be handy ( but not essential) . Staying on the left hand side the next important area is the cut through, this is a slightly deeper area and does appear to be a winter hot spot as well as allowing for a non muddy fishing spot in the winter. The water will drop down a few feet and careful plumbing will find the channel that used to exist ( then again it is pretty obvious). The next area on the left hand side that is worth noting is the open area just before the end marker at the western end of the lake. There is a loads of space there and if you want some lazy fishing when the lake is full there will be plenty of spece here with a reed lined far bank in easy reach. Moving onto the other side of the lake, this is where the local anglers seem to fear to tread as you actually have to either walk, cycle or barrow all your gear around. This side of the lake is really unpopular and there will always be space here. The down side is that the the top right end of the lake is pretty sparse for swims and the ones that exist have a pretty steep drop to the water. Continuing our trek around the right hand side of the lake, the cut through on the left of the bridge ( see map marker below) is called “the Banana” and is possibly the most under fished area of the lake, which is a shame as it is a cracking little area. The area is 2 channels one of which ends in a dead end and one ends in a lock into Niewermeer ( see a later post). When the lake is shut down for a rowing competition this area is always open for fishing. Really anything goes, due to the free baiting ban I have had good success with simple rigs, ie just a lead clip and simple knotless knot rig with a PVA bag / stick. Bait wise anything quality seems to work. I had good success with CC moore Meteor in the summer and CC moore pineapple popups in the winter. I have fished a fair amount in the last 4-5 years I confirm my friend caught a carp of 36.5lbs 3 years ago and it was a beast of a mirror. the average i ghet is about 18lbs mostly commons. I find simple rigs with a largish boilie keeps the bream away. you can also catch them on the top in the evenings but beware the birds !! thanks for the info.